De Nora Water Technologies has established itself as the undisputed technology leader in the field of electrochlorination disinfection. 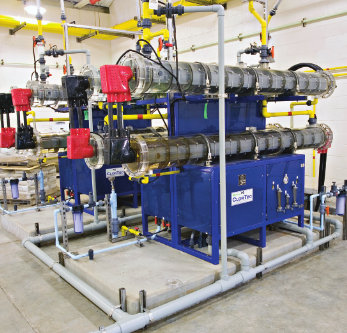 With more than 35 years of electrochlorination experience, De Nora Water Technologies offers seawater and brine treatment solutions for water and wastewater applications to municipal and industrial operations. ClorTec® brine on-site sodium hypochlorite generating systems have a strong reputation as the leading global technology provider with a proven track record of global installations. ClorTec® systems have been designed, manufactured, installed, operated and serviced since 1995. Over that time, more than 3,000 ClorTec® systems have been installed globally. The experience gained from these endeavors is unparalleled in the industry and our drive for product improvements and enhancements continues.